As part of our business, we are always keeping up to date with the latest trends in the industry so that when you – our customer- come to us we can advise on the latest designs and options as well as listening to your own personal needs and expectations. 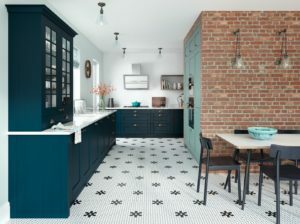 From storage options to colour schemes and kitchen layout, it is always exciting to see new trends emerging and to introduce our customers to ways they can integrate new design ideas into their kitchen in ways they may never have been aware of. Should you have the benefit of space on your side, a large room gives you maximum flexibility with your kitchen layout options. One such option which remains a popular feature with all styles of kitchen is the addition of an island. 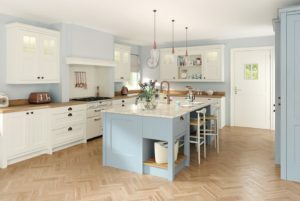 Islands have a variety of uses which is no doubt one of the main reasons that they are a feature point in many kitchens – used as a food prep space with a sink and built in appliances, a socialising area with breakfast bar seating, providing additional storage – large drawers, more cupboard space – there are many choices. Islands can also create a design focal point should you chose a contrasting colour form the rest of your kitchen, a very current trend in 2018. 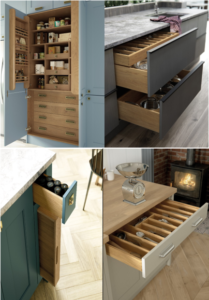 One of the main design aims within any kitchen is creating storage space and as we all know there really is no such thing as too much storage space! This is where clever design comes in – cabinets and corner units with clever storage internals, drawers with cutlery organisers or peg boards in pan drawers. Unsurprisingly, the much-loved larder remains a feature in many kitchens due to the various storage benefits it provides. Current trends advertise any colour imaginable, with contrasting colours veering away from tradition. 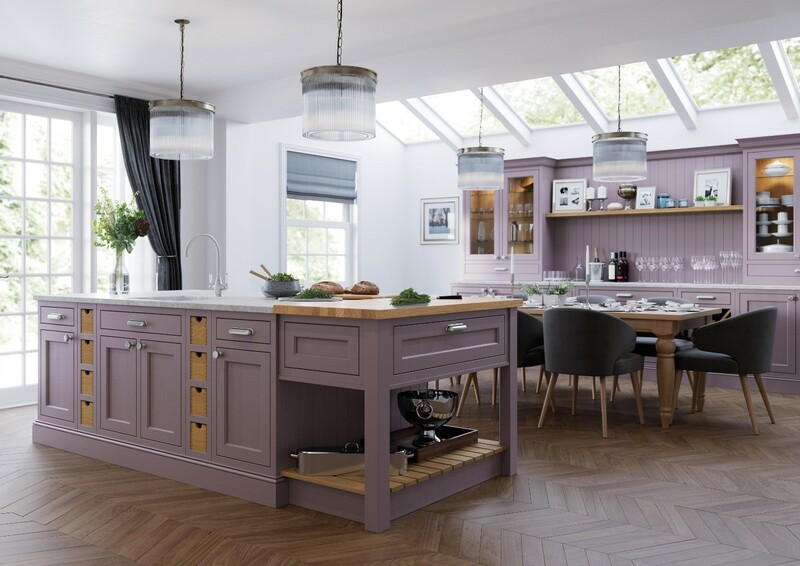 However, time and again we have found that although people like to look at and consider bold colour choices when it comes to their kitchen design, the timelessly sophisticated and ever-popular muted hues such as ivory and grey prove to be most popular. 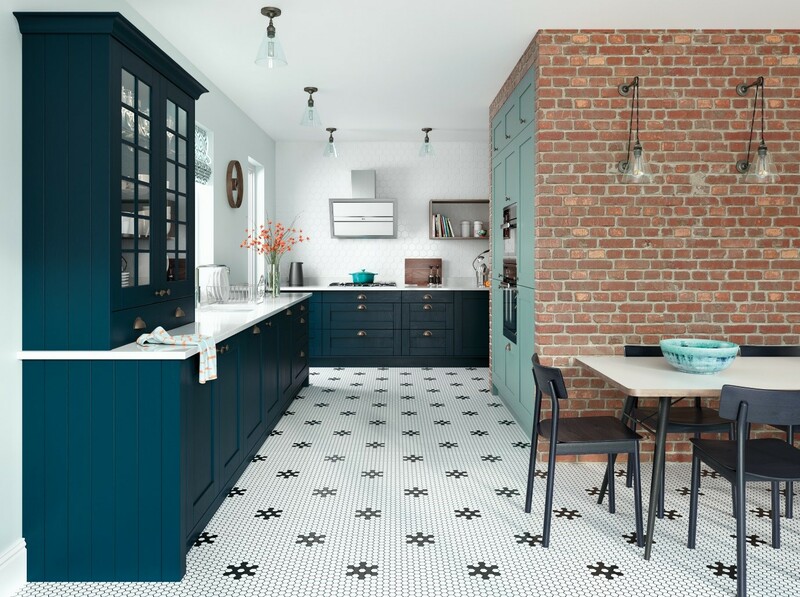 Many customers opt for a pop of contrasting colour in their island, giving a contemporary design feel to their kitchen style whilst retaining a classic style. The colour and material of the worktop also has a significant impact on the aesthetics of the room. Quartz and granite remain popular for those not restricted by budget, but new and ever-changing innovations mean that Formica worktops provide many choices that can look equally as stunning. In terms of colours, the trend for lighter worktops most certainly continues and again a different colour worktop on the island can be used as a design feature.